Cover Your Cat’s Backside With Bling! 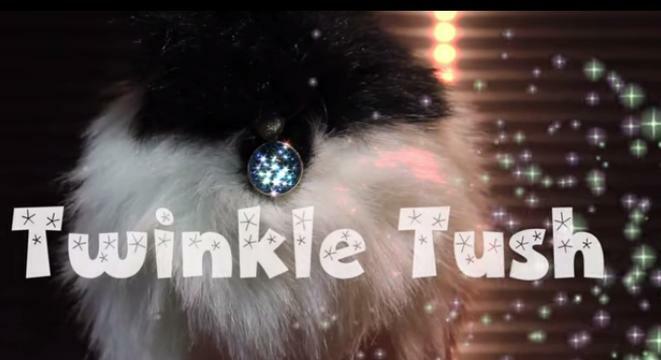 When I first heard about Twinkle Tush, I thought it sounded rather sinister. You can cover your cat’s rear exit point with sparkly bits? Does it involve glue- is something…inserted? This sounds awful! Relax. It’s nothing as horrific as all that. Clearly, I have watched too many cartoons, and need to learn that not every animal product is made by ACME. So what is the Twinkle Tush? You can purchase the blue shiny circle on a string for $5.99, plus $1.50 for shipping. You’ll even get a free sticker to proudly display your ingenious purchasing decision. The video below shows the Twinkle Tush in action.